Historic Spanish Point in nearby Osprey, Florida is both a garden and a museum in one, and top attraction to visit on any Siesta Key vacation. The grounds celebrate the incredible history of the western coast of Florida, starting thousands of years ago and reaching into the 1800s. It is the largest actively preserved archaeological site on Florida’s gulf coast and covers an extensive natural history as far back as the prehistoric period. What Will You Find at Historic Spanish Point? 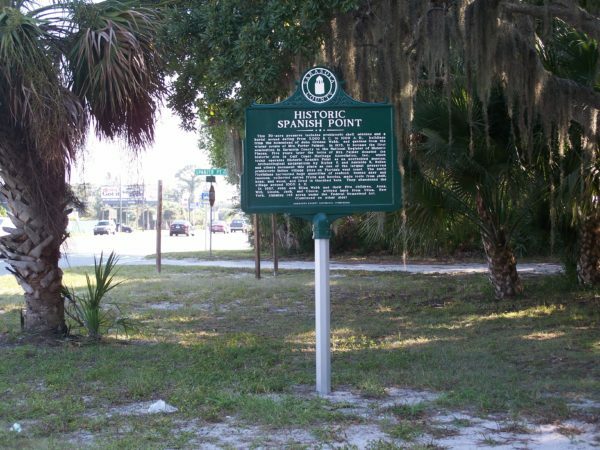 Historic Spanish Point is a celebration of protection, preservation, and the human history that led to such a vibrant culture in southwest Florida in the first place. There are four different themes the museum covers, with exhibits related to each of them: Prehistory, Pioneers, Palmer, and Plants. The prehistory exhibit area is actually built inside of an ancient shell mound. The pioneers’ exhibit area covers the last few hundred years of the area’s modern settlement. The area includes inspiring architectural designs, authentic outfits, letters, and other historical items. The third angle of the grounds, Palmer, covers the wonderful developments of Bertha Palmer and her homestead starting in 1910. Palmer selected the area to develop a 340-acre estate, notably filled with lush gardens and spectacular flowers. The Palmer angle of Historic Spanish Point includes a luxurious walk through Duchene Lawn by the famed Sunken Garden. A famed Pergola (pavilion) stands by the edge of the coast looming over Sarasota Bay. The Palmer Gardens lead into the final theme of the grounds incorporating environmental protection and local plants. About 50% of all native plant species in the entire county can be found here. There are many different things to do at the iconic grounds. Guided tours are available through many different areas, including Mrs. Potter Palmer’s Jungle Walk and the Butterfly Garden. Nearly every day at 12pm to about 2pm, a docent guides visitors through different portions of the grounds, covering a unique and information-driven take on the extensive Spanish history here. You can sign up for these guided tours at the front desk when arriving to the site. There are also events throughout the year that educate the public and share in the ancient culture of the museum. Coming up in 2018, Kassie Kemp, from FPAN’s West Central Region, will take guests through an informative pottery class. The class is January 13th from 4pm to 6pm. Visitors will learn about the Native American pottery-making process that they used for hundreds of years, as well as special insight into the prehistoric era of Sarasota. The event is called “past Contained” and it is $10 per person for Historic Spanish Point members and $15 per person for non-members. Guests visit the grounds monthly, offering instructional courses and lectures on a number of topics incorporating archeology, botany, science, and anthropology. Bruce Weaver, a resident orchid expert, offers frequent orchid workshops throughout the year, which you can get more information about by calling: (941) 966-5214. The museum is about a 15-minute drive south of Siesta Key at 337 N Tamiami Trail, Osprey, FL. Before entering the historic site, guests will arrive at the visitor’s center to pay admission and receive a parking pass. Prices are $12 for adults and $5 for children ages 5-12. Hours are 9am to 5pm Monday through Saturday, with special Sunday hours 12pm to 5pm. Tickets are not sold after 4pm. The entire park will take about two to three hours to navigate. Allow additional time for any activities or guided tours. There’s no better way to spend a half day than visiting Historic Spanish Point, and the short trip there is certainly well worth your time. Siesta Key and the surrounding areas can be your next vacation getaway. Historic Spanish Point is just one of a dozen or more attractions to explore and enjoy no matter what time of year you visit. Take the full family on a journey deep into Florida’s past at Historic Spanish Point. We offer some of the best and most competitively priced Siesta Key vacation island rentals filled with amenities for a relaxing stay as you adventure out into the area. Learn more about Siesta Key attractions and accommodations by contacting us at (800)-624-9276.